This article on driving lessons with a difference appeared on the Stuff news website today. 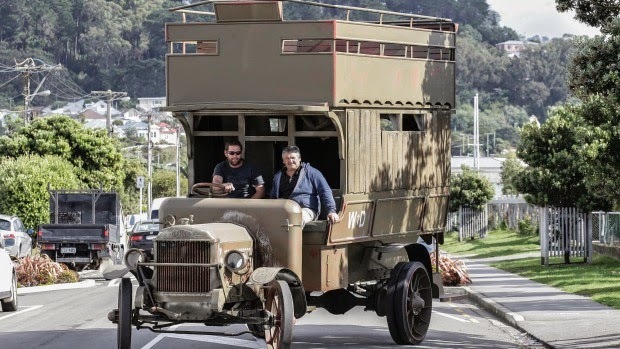 It describes how more than a dozen people were taught to handle century-old trucks and buses in Kilbirnie on Saturday, ahead of an Anzac wartime parade to take place in Wellington on 24 April. There will be 15 trucks and buses in the parade, plus four vehicles that will be stationary on Taranaki Street - two Mark IV tanks and two cannon. Of course, London buses have nothing to do with Gallipoli, but this just shows a snippet of the many other WW1 commemoration events that are happening in the coming week or so, of which our diorama is just one.